While exploring Thailand and its culture as part of Pathway’s VIVA! World Tour, the armchair travelers became fascinated with the country’s majestic and revered Asian elephant. For centuries, Asian elephants have been part of Thailand’s history in good times and war times, when they led Thai kings into battle. Today, the now endangered elephant is a national emblem with its image appearing on Thai’s stamps, coins, the Navy flag, architecture and artwork. Thai culture celebrates the elephant as a symbol of fortune. The superstitious will pay money to pass underneath the beast’s body in the hopes of gaining the animal’s luck. Besides being superstitious, one must also be brave as elephants are the largest land animals in existence today. Asian elephants, slightly smaller than the African variety, can stand up to 11 feet tall and weigh as much as 11,000 pounds! The saying, “An elephant never forgets,” comes from the elephant’s renowned intelligence and belief that elephants are thoughtful about their actions. These smart creatures are also recognized for their longevity—living on average 60 years in the wild and 80 in captivity—and their social, pleasant nature. According to Thai legend, marriage is like an elephant. The husband is the front legs, choosing the direction, and the wife is the back legs, providing the power! 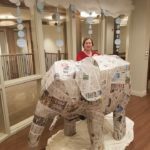 To honor the Asian elephant, residents at Heartis Village in Peoria used the ancient art form of paper mache to create one of their own and named her Miss Violet. Follow these directions to make your own “Miss Violet” elephant. Measure 1 ½ cups water, 1 cup flour and ¼ cup school glue. Pour the measured ingredients in a plastic bowl. Blow up two balloons, one to full size and the other to half size. The large balloon will be the elephant’s body and the smaller one will be the head. Tape the head balloon onto the top side of the body balloon. Cut cardboard tubes into four equal sections, each approximately 4 inches long. These will be the elephant’s legs. Tape the cardboard-tube legs to the underside of the body balloon with two on each side. Cut a small paper plate in half. Tape each half onto each side of the balloon head as ears. Cut 2-inch by 10-inch strips of construction paper or newspaper. Dip the paper strips into the paper mache paste. Squeeze off the excess paste. Cover the elephant frame, one strip at a time. Wrap the pasted paper strips around the balloons’ circumference, around the cardboard tubes and around the paper-plate ears. Set the elephant aside to dry. 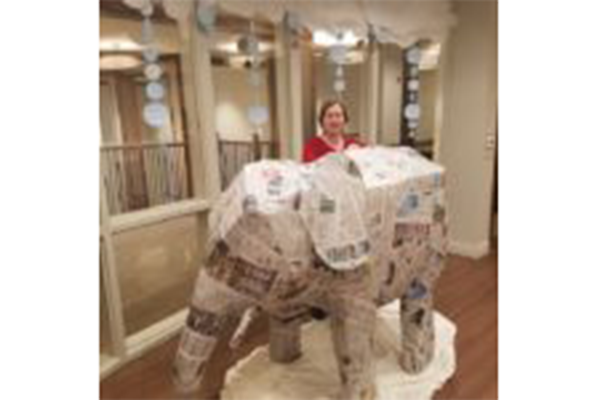 Paint your elephant with a gray and brown paint mixture. Paint eyes onto the face with a fine or small brush.